When I was a kid, I would eat the bread and pick out the entire filling – those pesky pieces of fruit! So my nonna started to add the Pan d’oro (Pandoro), to our holiday order with the bakery. 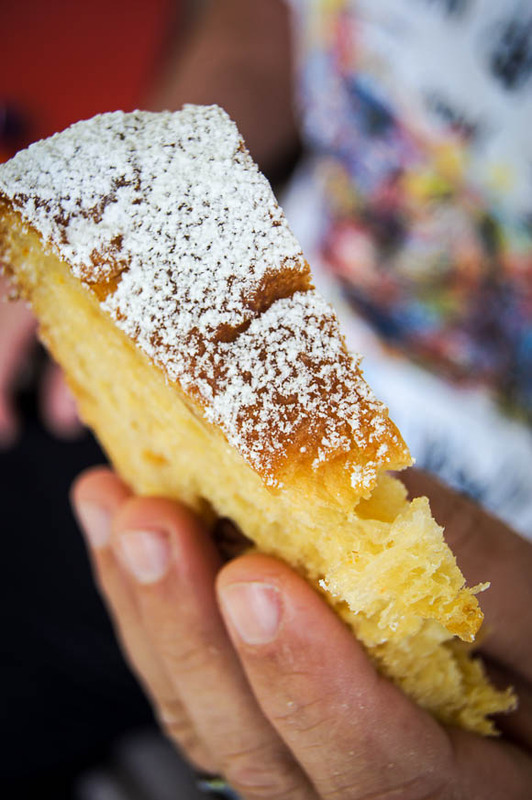 Unlike the Panettone, which is made with flour, butter, eggs and sugar and filled with candied citrus fruits and sultanas, the Pan d’oro is made with flour, eggs and butter and nothing else; leaving this sweet bread to be the perfect base to be served with cream, hot chocolate or drizzled with Nutella. Do I need to say more? I mean, seriously? Anything smeared with Nutella and its game.over for me. Both Pan d’oro and Panettone come from two wonderful and rich-in history Northern Italian cities: Pandoro takes its origins from Verona, the city which the most romantic amongst you will link to the names of Romeo and Juliet, while Panettone belongs to the history of the city of Milan, in Lombardy and its one of the traditional and most ancient sweets of the Milanese tradition. 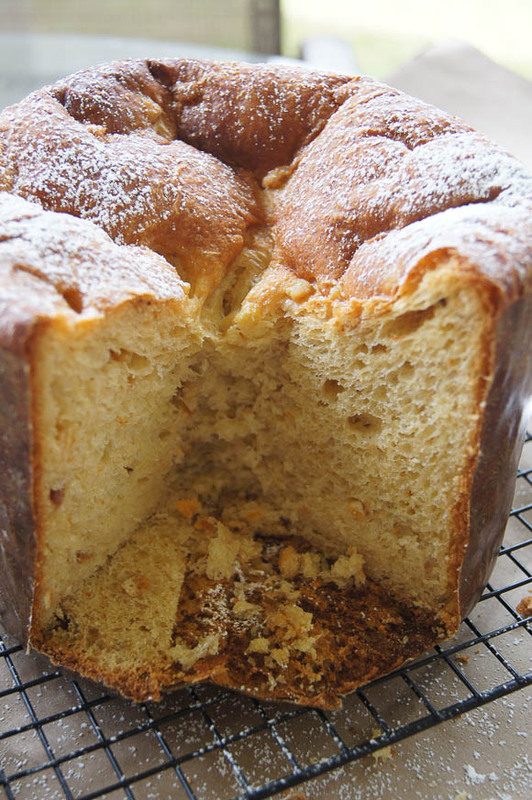 As I got older, I learned to appreciate the Panettone, but the Pan d’oro still has my heart. So when I saw this recipe, I was going to totally go all rebel on Rose and leave the filling of orange and golden raisins out of the recipe. And planned a zabaglione sauce to serve it with. But, then a couple of weeks ago, I got a package delivery and it contained 2 pounds of candied orange peel and a couple of Panettone Paper molds – compliments of Joan from Alpha Baker Sorceress’ Apprentice. Thank you again Joan! I had no way out, I knew I had to stick to Rose’s recipe at this point. When you decide to make Panettone you need to decide to REALLY BE committed to the process. Making Panettone at home is laborious and you must not be in a hurry. Yes, you may find an “easy, quick recipe out there” – but, don’t be fooled. Panettone is unique. It takes 3 to 4 risings to have a good product, soft and full of taste. So full commitment and patience is key here, because while putting it together is not complicated, you do have to spend most of the time waiting for the dough to rise and rest numerous times. At the end Panettone is basically building dough, into dough, into dough. And this takes dedication and time. Refer back to the word “commitment.” And you will see why once you finish reading this post. Rose instructions are meticulous, and in some cases so detailed, that at one point I became a bit lost in them – I had read the recipe forwards and backwards and, I’m not exaggerating, about 20 times. At one point, I became so confuse, that I had to sit and write down a flow chart of the steps and post it in my kitchen so I can be marking off each step as I completed them – Since I was planning on doing this over the week, I was going to make sure nothing got past me on this one. Day 1 - The first step is making the Biga (dough #1), a pre-fermentation method, which is used in Italian baking. Made up of flour, water and yeast combined with an extended fermentation time (in this case 3 days), gives biga-assisted breads an earthy, almost nutty flavor profile. My biga mixture came together quickly but, not as described by Rose –“smooth paste” did not match my not so smooth paste, but instead I had an actual ball of dough. I hate to repeat myself, but I’m so thankfull for our Facebook group – you guys, are lifesaver! Because, when anything goes a bit wonky during our scheduled baking, it’s good to know that I can immediately send an SOS message and get reassurances when I’m going the wrong path so I can adjust. Apparently,I was NOT the only one with a ball of dough and NOT a smooth paste. After getting confirmation that my biga was behaving as it should, I put it in the refrigerator to chill for its 3 day fermentation phase. Day 2 - rest up, you will need it. Day 3 – Prep the filling. I soaked my orange, and golden raisins with orange liquor – I did not have triple sec, so improvising step was used. I also skipped using the pure orange oil and opted in zesting a full orange. If I seriously rethink a redo, I would use the filling to get the most creating and use other ingresdients, like chocolate chucks, or marzipan! I think dough fillings are where there’s room to play around, so make it count. I also put together the dough Sponge (dough #2), which is mixing the biga with more flour, yeast, water and golden syrup and eggs, the dough at this point looks like a smooth thick batter. Then you cover the whole thing with part of dough #3. More flour, dry milk, yeast and salt. And guest what we are going to do now? Rest up. First at a warm setting, which I had to create, because the baking gods decided it was a good time to send Florida some cold weather conditions and my house was cold as an icebox. So, I turned into my guaranteed proofing step – turn oven to 200, warm it up, turn it off, then leave light on, stick dough in there to grow. After this… BOOM! Back to the cold refrigerator it goes for a 24 hour chill. Day 4 - Back out for the other half of dough #3. This times more golden syrup (nothing wrong with that), more eggs, the soaking fruit liquid and the soften butter – oh glorious butter. The dough starts as almost a cake batter and as it spins, it starts to come together into this silky, golden smooth (sticky) dough. I turned into a baking rebel here, and left my dough in the bowl, in order to add the soaked fruits and using my bowl scraper mixed those in. I also did the turns in the bowl as well. I found since the dough was very tacky, using the scraper was much easier. Man, by this time, this dough has taken more naps than my husband! After this rest, you fold it again, and into a zip lock it goes and more rest. You can let it rest for 6 hours or up to 2 days. At this point I was a bit over it, and since it was Day 4 and the last 2 steps were before baking, I decided that 2 days in the refrigerator was the way to go. (If I’m honest with myself, I needed a rest too). Day 5 – I removed the dough from the zip-lock bag, and I had another of those doubt moments, since Rose instructions say “ Cut open the bag and peel away from the dough”… Which lead me to believe that there was some type of “growth” and “proofing” that needed to happen? But, my dough, while it did show some growth, did not need to be peeled away or cut it from the bag. I decided to just move on. I shaped it into a ball, put it in my Panettone mold, and back into my warm “oven” to do its last and final rise. Which took about 3-4 hours. My dough was beautiful, it double up and it was well above the top of the paper. We were in business! And this is when I should have stopped and just placed it into my hot oven. But, because rebel or not, I still follow directions, Rose asked to snip a 1 inch deep cross into the top of the dough. Once I did it, the top sort of collapsed on me, not by much, but it did give me a moment of panic, but I just figure it would bounce back during its baking time. I carefully placed it in my hot oven, on top of the baking stone and dumped some cubes … waiting for the steam to rise. And… Nothing happened. No steam. I did not stick around to figure it out (remember I was over it). I put the timer and waited the first 30 minutes of baking in order to do the first check. At 35 min, I took a peek and my top was golden brown but the HORROR! My beautiful proofing dome was no more; the middle of my bread had sunken inward. I almost burst into tears – but, I was too tired. After all of this nurturing and babying … lets just say, there was a lot of Italian swearing at this point. Another 40 minutes, one last check for confirmation of the right internal temp and it was removal and cooling time. I left it alone and we cut into it the next day for our breakfast. I been baking for a lot of years, and I think there is nothing more satisfying that baking bread, to take all those hours (or in this case) days of work and finish them with that simple first bite of your completed product. And when said finished product rewards you with a bite of airy, flavorful bread you get to shout it over the rooftops. Damn it! This was totally WORTH IT! It was so delicious. Tom loved it; he ate 3 pieces for breakfast, while I happily snapped pictures for this post. As for me, I would have liked it to be a bit sweeter. I simply remedy that with a heavy dusting of powder sugar on top. And it was just fine. I may or may not have smeared my slice with Nutella, while Tom followed my example and drizzle some orange honey on his. All in all, I was very happy with the results. Was it as beautiful as I hope it would be? Maybe not, but as bakers we sometimes need to loosen our internal perfectionist and just enjoy all of our work with that perfect first bite.